John, thank you so much for your visit and kind compliment. I appreciate both very much. I’m not just being kind though….. Seriously Art gallery stuff here! So sorry to hear about your cats. I love this partial, minimal face. And have to go with Jodi on all her points. Great work. You are both too kind. Thanks so much for your visit and encouragement! Thanks, Kerfe. Also easier, I must say, but in the midst of a drawing, when I hold it at a distance and like it as it is…..sometimes I don’t see a reason to continue it. This paper allowed me to really fade out the graphite nicely too, so … bonus! Glad you like it. Aw, thanks so much, Donna. I know they are out of pain now, so it’s a blessing at this point for them. I wonder though if I’d be so drawn to animal faces if it weren’t for their passing, which is why I mentioned it. Can’t seem to stop drawing faces! Maybe it’s what I’m meant to do? Who knows, but I’m enjoying it. Thanks! Hi Laura. I am sorry to hear that you lost your two kitties. Our furry family members certainly hold special places in our hearts, don’t they? Your sketch today captures the essence of the kitty so much that we don’t need to see its entire face. Makes it more mischievous too, which can describe most kitties. Purrrrrfect! Thanks so much, Kathy – and may be why I keep drawing more also! Glad you enjoyed it. Love it! Such a sweet face! Very nice drawing. I love the eye! Inspiring! Yes, and thank you! I really appreciate it! I usually stop when I’ve captured what drew me to that particular face most. Glad you enjoyed it! Wow, a very mysterious look. Lovely drawing today. Thanks, Sharon. The photo was *muah* perfect. 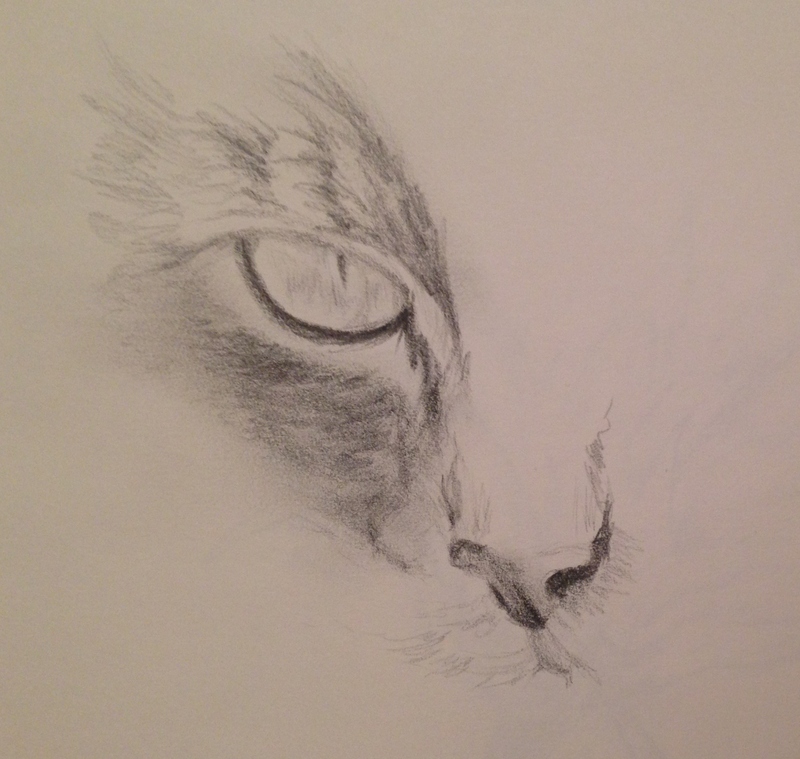 Just loved her soft furriness and had to try and describe it with a pencil. Nice, I like the half face. Cats have a special place in our heart. We also lost our gray kitty late last year. We will get another kitty but not sure when. Thanks, Carmel. Sorry to hear about your kitty. I used to say there is nothing going on in the world or my life that a purring cat on my lap and a book (or art supplies) in my hand couldn’t solve. Glad you liked this one! Thanks, Teri! I’m very happy you do! And thanks for her blog, I’m now following. Oh, you’re very welcome. Really enjoying her posts – I just found her recently as well. Beautiful! We have a stray that adopted us. We had an inside cat for 23 years and a dog we lost with a big personality. I can’t bring myself to get real attached again. I don’t blame you at all. The hardest part for me was watching them go down. Every bit as hard as watching a human you love when that happens. The difference being we can at least put a cat out of its misery. Glad you enjoyed this. I am so far behind in following blogs – but just want to say love, love, love your new stuff! Thanks, Tori, yes they do. Penny passed in September and art really helped me. Lots of abstract cats back then. I’m so glad you enjoyed this!! Oh, I just want to rub noses with your kitty! ❤ I miss my kitties, too (though it's been a couple of decades since I last had one). lol thanks so much Teresa! Isn’t she the cutest? I wish she were mine. ❤ Loved the photo, couldn't resist it! I love when reference images grab me like that. Beautiful, mysterious and dramatic. Fantastic drawing and choice of composition. It is such a pleasure to watch you progress in leaps and bounds on this portrait drawing adventure. Thank you for sharing this lovely piece of art. I agree with what everyone else is saying – you are really nailing these partial faces! So much intrigue about Percilla, on top of the power of that single, watchful eye. Great stuff! Wonderful Laura! The partial face is exquisite in this drawing, nailing the value ranges beautifully. I’m so sorry to hear about your kitties. We definitely get attached to our little fur babies. My two little girls are my world. I really love how you captured Percilla in the drawing above. I can look at your drawing and see the expression that I have seen on Percilla’s face so many times. Drawing half of her face was a perfect choice and so dramatic. Less is more. I greatly appreciate your kind words. I would love to feature you and this drawing on my blog as a Guest Post if you are interested!! Continue creating your beautiful drawings. You are an inspiration to us all! Could you give me your email address so we can talk about you as a Guest Post? I look forward to hearing from you! Sure, and thanks! It’s createarteveryday at comcast dot net! Hehe….Awww sis…you flatter… And I LOVE that about you!! 😉❤️lol Thanks!! Rectangle !! Was meant to be fect….after purr? iPad deciding what I want to say again, grrr! Thanks Joshi! It was an amazing photo; Jade captured an incredible moment. Not easy with a cat!